Alright. You have the standard calculator but it is BORING - right? No more boring with Mia. 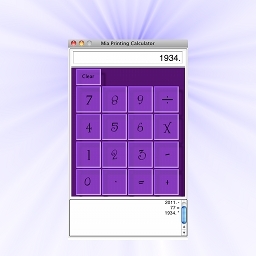 Mia offers themes and the ability to work like a modern day printing calculator. Print the screen, print the calculations, print to PDF, change your theme whenever you want and even save your theme to make it a default theme. Lots to do and lots of fun. No more boring calculator! This application is lightweight, accurate, easy to use and obviously does not require the internet.